1. Prep. Move the furniture and any area rugs away from the walls, and take down any window treatments that are next to or underneath any trim you will be painting. Position the drop cloths. Apply the painter’s masking tape to protect the surrounding surfaces, and press down firmly along all edges facing the trim. Using the putty knife and wood filler, patch any holes or dents in the trim. 2. Wash and scuff. Wearing gloves, wash the trim with water and the cleaner or deglosser. When the surface is dry, lightly scuff up the paint with the sandpaper or sanding sponge, and wipe away the residue with the dust cloth. 3. Prime. Using the brush, brush primer over any patches. If there is oil paint on the trim or if you are switching between light and dark colors, you need to prime all the trim. Apply the primer with the brush, taking care to get into all the curved surfaces. Complete each piece of trim before you go on to the next. Let dry. 4. Paint. Apply the latex enamel with the brush, using the same method described in step 3. To ensure a smooth coat on trim pieces that are too long to paint in one stroke (especially if you are working on a ladder), begin painting at one end or corner and gradually lift up on the brush as you complete the stroke. Begin the next stroke a workable distance beyond the end of the first stroke, and brush toward the first section you painted. After the overlap, gradually lift up on the brush. Continue in this manner until you have painted the entire trim piece. Then go on to the next piece. 5. Recoat. Inspect the paint. If you see gaps, apply a second coat. Do not apply a second coat unless it is needed, though, since too many layers of paint will eventually obscure the trim’s details. If you have trim with lots of detail that you want to emphasize, paint it with a gloss finish and the ceiling and walls with a matte finish. 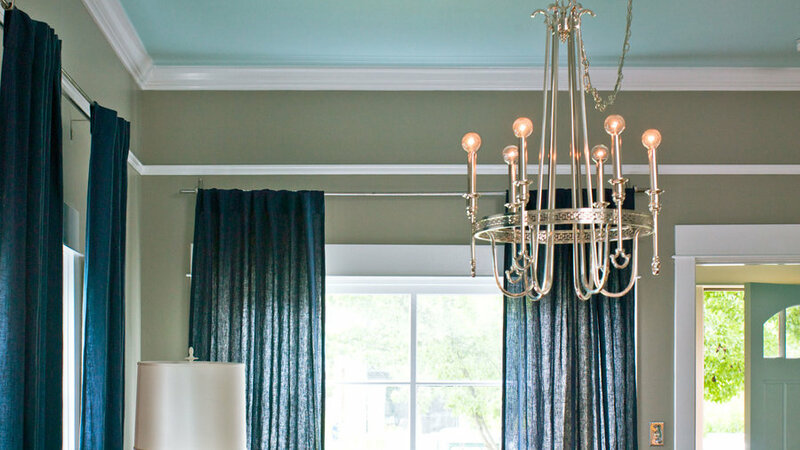 If you want to tone down trim details, paint everything in a cohesive matte finish.